An event that was due to take place on Shrove Tuesday but had to postponed. Phyllis, asssisted by her daughter Andrea, served up a delicious menu of soup (three varieties) followed by pancakes and rounded off with assorted desserts. The total raised, including donations, at the moment, is £130 which is to support the Church Urban Fund. On Sunday afternoon we were treated to a performance by the Choir of musical items ranging from songs from the shows to spirituals. The show was held together by a virtuoso performance as conductor and teller of hilarious corny jokes by Keith. A thoroughly enjoyable afternoon. 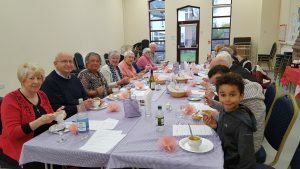 £253 was raised for church funds. This is a new venture for St Hilda’s. It will be a quiet reflective evening based on Peregrini Prayer. It is intended that this will take place once a month.